My boss, World Resources Institute President Jonathan Lash, told a standing-room-only crowd of around 200 that people need to realize there are solutions to climate change. Journalists need to better report on them so that the public can understand that our problems don't have to be those of our grandchildren. Jane Lubchenco, the head of NOAA (National Oceanic and Atmospheric Administration), also spoke at the breakfast session - moderated by New York Times Environment Reporter Andrew Revkin - during the Society of Environmental Journalists conference here in Madison, Wisconsin. She said it is important that environmental scientists have begun to learn from social scientists about how to get better at communicating solutions to the consequences of climate change. Lash said that former Vice President Al Gore's next book, called Our Choice and to be released November 3, will also focus on solutions. Lash added that the consequences are great from our painfully slow policy reactions, our continued use of fossil fuels, and the economic pricing that fails to reflect our energy usage. There are bright spots. 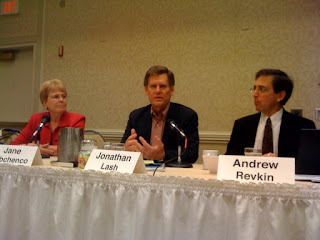 The reestablishment of scientists in policymaking under President Obama has been enormous, Lash said. But that still hasn't solved the problem that people are more interested in David Letterman's love life than in sea bed methane. He argued that the "roadmap" approaches being undertaken worldwide, nationally, and locally to reduce CO2 emissions are extremely different and more complicated than any other major environmental undertakings of the past. Goals must be met by 2010, 2015, 2020, 2025, and on. We don't get to a certain point and then we're done. Lash said the climate debate we're having now is really just about how we're going to make a major economic transition away from burning fossil fuels. If we don't, the world will be four degrees hotter in 2050 than it is now. And it should be pretty clear that nobody wants that.